Heirloom of Bourke Street is an icon of confusion, a perplexed modern venue decorated with Japanese items at every nook and corner. The façade is dominated by a contemporary full-length glass window stenciled with its Kanji’s name, arranged in the style of traditional calligraphic seal. The extravagant interior is a sea of glistening black and flaming red, with a sports-bar type projected screen placed prominently before a row of red swivel bar stools. Bottles of Japanese alcoholic beverages seated ostentatiously on a fancy octagon shelf amidst its collection of drinking glasses and oriental lantern. Bright red Tolix metal dining chairs and painting of formidable Edo-era Shoguns inhabit under the same roof, forming a bold picture comprises both rustic industrial and old-style interior. The restaurant serves crushed avocado and cereal in the morning, Bento box and Teishoku sets in the afternoon, and chef-selected Omakase Nigiri sushi by night. Japanese Asahi, Yamazaki and Hakkaisan are served side by side with its Western counterparts of Jack Daniels and Hennessy. The online reviews dance around on the two extreme ends of spectrum: You can either love or hate this place. 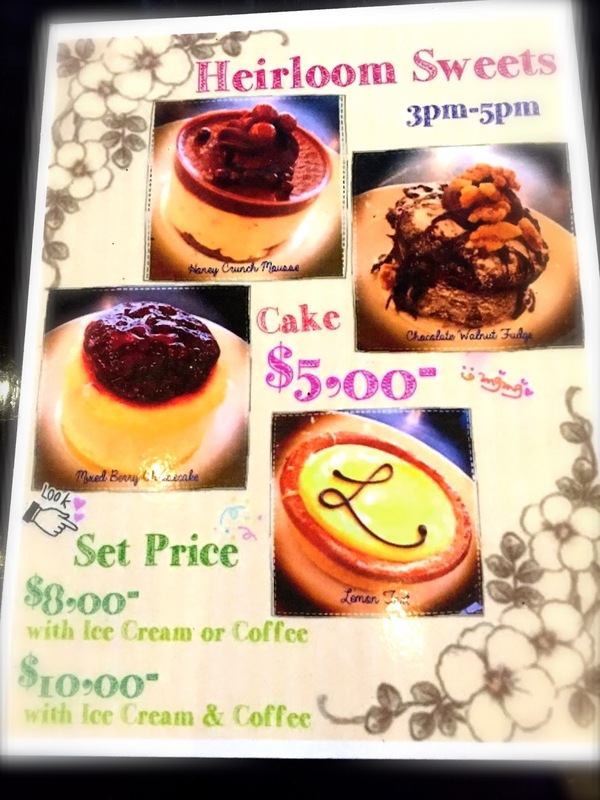 We were enticed into Heirloom by an unassuming A4-size poster showcasing its selection of desserts sold at off-peak special price. And what a pleasant serendipity! Like an oasis of serenity within an urban jungle, the usually loud Japanese Tapas bar is unusually quiet during the 3 to 5 pm slot when majority of the populace is trapped in their business suits and confined offices. Each patron is given both undivided attention and uninterrupted private space. Nostalgic anime from the Japanese award-winning Studio Ghibli is played on the large screen: Sometimes, it is the Chubby Totoro standing under the rain. Sometimes, it is the thirteen-year-old Kiki performing her exceptional Takkyubin delivery service on flying broomstick. The desserts are basic yet delightful. The honey crunch mousse is light and fluffy, topped with beautiful ganache and its essential crunchy elements. The chocolate walnut fudge is creamy with an enjoyable buttery texture. The lemon tart is delicate, moderately sweet with a slight hint of tanginess. The mixed berry cheesecake is pleasingly smooth and comforting. Each dish is artistically plated and will definitely put a smile on your face. And with an attractive rate of $5 each, I guess it is only natural that we are hopelessly hooked to this place.